Travel and holiday vouchers and coupon codes, discounts and offers from TUI, First Choice, Easyjet holidays, Jet2, Telegraph travel, Jet2 holidays, Etihad, Superbreak, Travelzoo, Titan Travel plus many more. Also insurance deals for cheap travel insurance, and theme park offers. In total 17 links were found which refer to 123holiday.co.uk. Individual words like 123holiday, Holiday and Directory are frequently used in text links from other websites. The most important link sources for this website are Retail-shop.co.uk and Collisiondamagewaiver.co.uk. 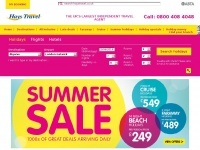 The homepage of 123holiday.co.uk and the subsite are most referenced by other websites. The table shows the most important links to 123holiday.co.uk. The table is sorted in descending order by importance. The table shows websites of 123holiday.co.uk, which are often linked by other websites and therefore they are classified as important content. Haystravel.co.uk - Holi­days | UK's Lar­gest In­de­pen­dent Tra­vel Agent | ..
Globaltraveluk.co.uk - Glo­bal Tra­vel: Tra­vel Agent, Worldwi­de Tra­vel, ..
Manchesterairport.co.uk - Offi­cial web­site for Manchester Air­port, live flight ..